Elmer Bernstein (April 4, 1922 – August 18, 2004) was an American composer and conductor who is best known for his many film scores. In a career which spanned fifty years, he composed music for hundreds of film and television productions. His most popular works include the scores to The Magnificent Seven, The Ten Commandments, The Great Escape, To Kill a Mockingbird, Ghostbusters, The Black Cauldron, Airplane!, The Rookies, Cape Fear, and Animal House. 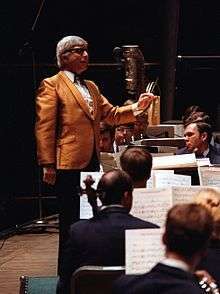 Bernstein won an Oscar for his score to Thoroughly Modern Millie (1967) and was nominated for fourteen Oscars in total. He also won two Golden Globes, an Emmy, and was nominated for two Grammy Awards. Bernstein was born in New York City, the son of Selma (née Feinstein, 1901-1991), from Ukraine, and Edward Bernstein (1896-1968), from Austria-Hungary. He was not related to the celebrated composer and conductor Leonard Bernstein; but the two men were friends, and even shared a certain physical similarity. Within the world of professional music, they were distinguished from each other by the use of the nicknames Bernstein West (Elmer) and Bernstein East (Leonard). They pronounced their last names differently; Elmer pronounced his (BERN-steen), and Leonard's was (BERN-stine). During his childhood, Bernstein performed professionally as a dancer and an actor, in the latter case playing the part of Caliban in The Tempest on Broadway, and he also won several prizes for his painting. He attended Manhattan's progressive Walden School and gravitated toward music at the age of twelve, at which time he was given a scholarship in piano by Henriette Michelson, a Juilliard teacher who guided him throughout his entire career as a pianist. She took him to play some of his improvisations for composer Aaron Copland, who was encouraging and selected Israel Citkowitz as a teacher for the young boy. Bernstein's music has some stylistic similarities to Copland's music, most notably in his western scores, particularly sections of Big Jake, in the Gregory Peck film Amazing Grace and Chuck, and in his spirited score for the 1958 film adaptation of Erskine Caldwell's novel God's Little Acre. Throughout his life, Bernstein demonstrated an enthusiasm for an even wider spectrum of the arts than his childhood interests would imply and, in 1959, when he was scoring The Story on Page One, he considered becoming a novelist and asked the film's screenwriter, Clifford Odets, to give him lessons in writing fiction. Bernstein wrote the theme songs or other music for more than 200 films and TV shows, including The Magnificent Seven, The Great Escape, The Ten Commandments (1956), The Man with the Golden Arm, To Kill a Mockingbird, Robot Monster, and the fanfare used in the National Geographic television specials. His theme for The Magnificent Seven is also familiar to television viewers, as it was used in commercials for Marlboro cigarettes. Bernstein also provided the score to many of the short films of Ray and Charles Eames. In 1961 Bernstein co-founded Äva Records an American record label based in Los Angeles together with Fred Astaire, Jackie Mills and Tommy Wolf. John Landis grew up near Bernstein, and befriended him through his children. Years later, he requested that Bernstein compose the music for National Lampoon's Animal House, over the studio's objections. He explained to Bernstein that he thought that Bernstein's score, playing it straight as if the comedic Delta frat characters were actual heroes, would emphasize the comedy further. The opening theme to the movie is based upon a slight inversion of a secondary theme from Brahms's Academic Festival Overture. Bernstein accepted the job, and it sparked a second wave in his career, where he continued to compose music for high-profile comedies such as Ghostbusters, Stripes, and Airplane!, Animal House, as well as most of Landis's films for the next 15 years. When Martin Scorsese announced that he was re-making Cape Fear, Bernstein adapted Bernard Herrmann's original score to the new film. Bernstein leapt at the opportunity to work with Scorsese, and to pay homage to Herrmann. Scorsese and Bernstein subsequently worked together on two more films, The Age of Innocence (1993) and Bringing Out the Dead (1999). Bernstein had previously conducted Herrmann's original unused score for Alfred Hitchcock's 1966 Torn Curtain. Having studied composition under Aaron Copland, Roger Sessions, and Stefan Wolpe, Bernstein also performed as a concert pianist between 1939 and 1950 and wrote numerous classical compositions, including three orchestral suites, two song cycles, various compositions for viola and piano and for solo piano, and a string quartet. As president of the Young Musicians Foundation, Bernstein became acquainted with classical guitarist Christopher Parkening and wrote a Concerto for Guitar and Orchestra, which Parkening recorded with the London Symphony Orchestra under Bernstein's baton for the Angel label in 1999. In addition, Bernstein was a professor at the University of Southern California's Thornton School of Music and conductor of the San Fernando Valley Symphony in the early 1970s. Additional honors included Lifetime achievement awards from the Academy of Motion Picture Arts and Sciences, American Society of Composers, Authors and Publishers (ASCAP), the Society for the Preservation of Film Music, the USA, Woodstock, Santa Barbara, Newport Beach and Flanders International Film Festivals and the Foundation for a Creative America. Bernstein made his home in Hope Ranch in Santa Barbara, California, in the 1990s. Bernstein died of cancer in his sleep at his Ojai, California, home on August 18, 2004. His publicist stated that he had a lengthy illness. He left behind his wife, Eve, two sons Peter and Gregory, and two daughters, Emilie and Elizabeth. He had five grandchildren at the time of his death. ↑ "Great Escape composer dies at 82". BBC News. August 19, 2004. ↑ "Introduction". Bernstein West. Retrieved 2012-04-10. ↑ Susman, Gary (August 19, 2004). "Goodbye". EntertainmentWeekly.com. Retrieved 2009-02-27. "Composer Elmer Bernstein Dead at 82". MSNBC.com. Associated Press. August 19, 2004. Retrieved 2009-02-27. ↑ Patrick Russ, liner notes for Christopher Parkening • Elmer Bernstein • Concerto for Guitar & Orchestra for Two Christophers (Angel CD 7243 5 56859 2 6), New York, Angel Records, 2000.